Artwork and other valuable items like antiques and jewelry are often targets of theft which is why it’s important to have them properly appraised and insured. 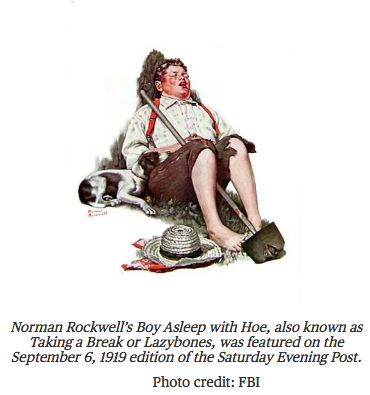 Take this story of the Norman Rockwell painting “Boy Asleep with Hoe” (pictured below) which has been returned to the family of its original owners in Philadelphia more than 40 years after its theft. In today’s I.I.I. Daily: the painting was taken in 1976 from a family home in Cherry Hill, New Jersey. The family then filed a claim to their insurer, Chubb. Chubb insured the painting, paid the claim and acquired the painting’s title. As Antiques and the Arts reports, the 40-year art mystery was solved when a lawyer contacted the FBI’s art crimes division in October that a client had a painting that didn’t belong to him that he wished to return. The estimated value of the recovered painting is put at between $600,000 and $1 million, significantly more than its value at the time of theft. The family returned the 1970s claims payment to Chubb in exchange for the painting. Chubb will donate the funds to Norman Rockwell Museum in Stockbridge, Massachusetts. I.I.I. tip: A standard homeowners policy offers only limited coverage for high value items. If you have belongings that exceed these limits, you should consider supplementing your policy with a floater, a separate policy that provides additional insurance. Before purchasing a floater, the items covered must be professionally appraised. Don’t forget to add these belongings to your home inventory.